Thread: Heroes WoW Addons updated list? Heroes WoW Addons updated list? Howdy all, Im trying to find an updated list of addons that work with heroes wow, I have tried quite a few and cant seem to get any to work with heroes. I googled and came up to an old outdated board from heroes wow and everything on that list does not say outdated when loaded but they dont work either. They will load but for example, skada doesnt display anything on its ui, atlas doesnt load maps, DBM doesnt do anything, etc. Thank you, I knew I was missing something easy. A life-saver. Thanks for the heads-up. If staff do not mind, you can find some good addons here. It is originally posted onother wow server, but suits this patch. Last edited by Fenuks; 07-11-2018 at 04:46 PM. Can't find dps meter, which one? Think it has Recount in it, if that is usable. Wow this is a big pack. There are multiples in it. 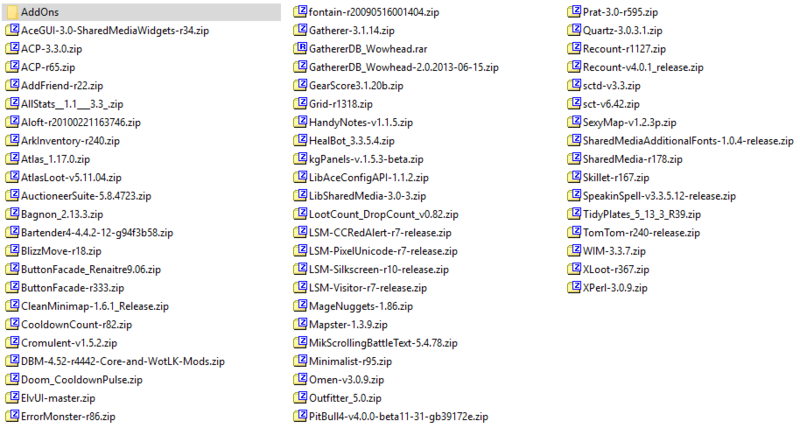 ----For new players like myself, do not extract the entire thing into your Addons folder. Most will not even show up in the Addons list ingame. Some addons are folders inside a folder or have multiple "dependency" folders. This is screenshot of zip extracted from gnoppy's link. I am tempted to create a guide off this if @gnoppy has no problems with it. Credit will be shared.